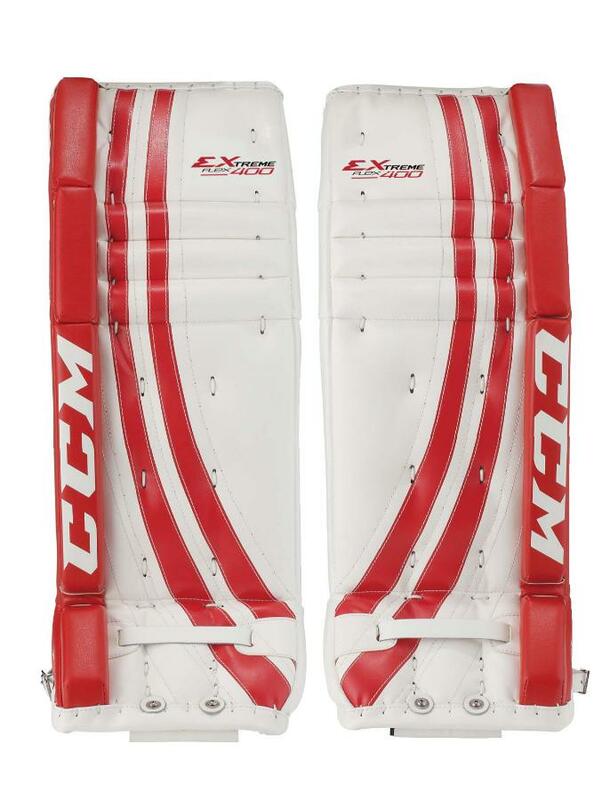 CCM E Flex 400 Jr Leg Pads | Sports Etc. MOBILITY 90˚ angled soft boot flex for extreme mobility. REBOUND CONTROL Low-density soft foam on the front reduces rebound to assure improved control. STABILITY Flat inside edge stabilizes the pad flush to the ice with bindingless knee and calf wrap for increased durability. BALANCE Wider knee stack landing surface keep goalies balanced in the butterfly. The Extreme Flex is the softest, lightest and most flexible pad from CCM. The Extreme Flex offers a 90-degree soft boot that gives more mobility at the ankle for quicker pushoffs and lightning-fast reactions. T flat inside edge stabilizes the pad flush to the ice with bindingless knee and calf wrap for increased durability. Wider knee stack landing surface to help keep goalies balanced in the butterfly. Sports Etc Performance To Value Rating– 8 out of 10. A great pad for a junior sized goaltender looking for a slightly beefier pad with traditional knee rolls.